Cindy Sprigg writes in the horror and science fiction genres and chose self-publishing because of the free time it afforded her. Read how it’s worked for her so far. 1. Pretend for a moment I’m a reader looking for my next book. Pitch me one of your books in five to ten sentences. 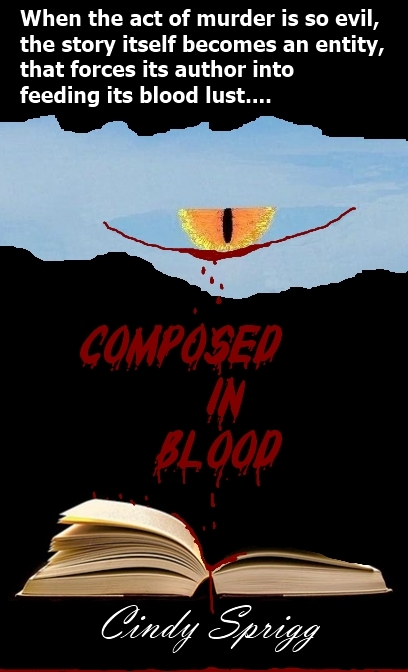 I would recommend reading my novel “Composed in Blood”. It is a horror/dark fantasy story that includes suspense, murder, mayhem and romance. There are several intertwining plot lines that twist and turn until the final climax, which catches most readers by surprise. Reader reviews have been very positive. If you like a story with plenty of action and graphic violence this one is for you. 2. What motivated you to become an indie writer? I got fatigued spending more time sending out query letters than I spent writing. 3. Have you been traditionally published? Why or why not? I have no idea, really. Agents seem to have specific types of stories they can sell, and if you don’t fit that profile, it seems you go direct to the slushpile. 4. How have you liked self-publishing so far? It’s a fair amount of work, but you can see the results of your labor. I think most people would prefer to be traditionally published and concentrate on writing, but this is an acceptable alternative that allows people to read my stories. 5. Tell me about the marketing techniques you’ve used to sell your books. Which ones have been the most successful? I have concentrated on e-publishing so far: there are facilities for allowing free distribution of my work, and that has helped get it out to an audience. In addition, I will try anything that will encourage readers to enjoy my stories. 6. Are there any marketing techniques you intentionally avoided or discontinued, and if so, why? I had a bad experience with PublishAmerica a few years ago, and I will not repeat that. Other than that, I try a method, and if it doesn’t work out I stop. I need to write, and I don’t need useless paperwork. 7. What’s the most important thing you’ve learned about self-publishing that you didn’t know when you started out? When I started I knew nothing; so everything, especially the law of copyrights. 8. If you could do one thing differently in publishing your books, what would it be? Perhaps start earlier in life and investigate the people I was dealing with thoroughly; this would save a lot of time that I could have spent writing. 9. Independent authors face the obvious challenge of marketing their books without the resources of traditional publishers. What advice do you have for an indie author just starting out? Don’t be overawed by the plethora of options available: take each option and investigate it. You have to convince readers that the benefit of reading your stories exceeds the opportunity cost of the purchase. This means you need to establish your name, your brand if you will. To that end use every tool at your disposal. 10. What projects are you currently working on? A bio of a straight man with AIDS, a Gothic romance story, a Children’s picture book, and several short stories. 11. If you could market your brand – not just one particular book, but your overall brand of writing – in one sentence, what would it be? I would hope it would be stories that capture the imagination of the intended reader. 12. How can readers learn more about your books? Search my website: links to all my published works are there, currently in e-book format, as well as hints about works in progress: cindyspriggsfanpages.weebly.com. I’ve read several of Cindy Sprigg’s book and have enjoyed them immensely. She has the capability of catching your interest right from the beginning and from then on she has you! This was a very honest interview which I think helps people understand what goes on with the mechanics of writing. Congratulations to you both, excellent interview!